IF you’re a globetrotter, Spain has to be one of the must-visit places on your bucket list. Yes, you have an entire lifetime to tick off every item on your list of places to travel. Yet there are still some destinations with a greater “must-see” factor than others. Reasons to visit Spain: Food, wine, culture and most of all, its impressive architecture. You already know of Madrid’s Royal Palace and Barcelona’s Sagrada Familia — famous tourist hotspots that need no introduction. Once in a while, favouring the roads less travelled in Spain will lead you to new alternatives that are great for a custom-made travelogue. This time, we’re giving you five more reasons to embark on your own bespoke travel — here are our favourite underrated places in Spain with equally magnificent views. Marqués de Riscal is a winery founded in ol’ 1858 in the region of Rioja. 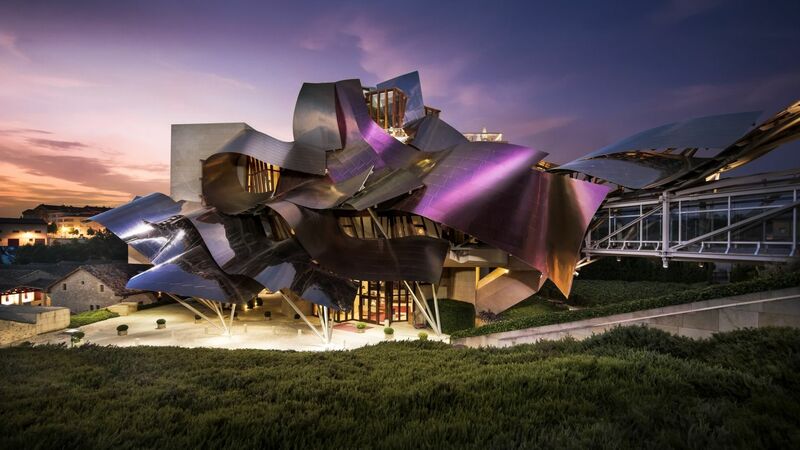 It then received a makeover by architect Frank Gehry, transforming it into a complex tastefully coined “The City of Wine”. Speaking to the design of Marqués de Riscal, its purple titanium panels represent the burgundy of the Rioja wine, with the stainless steel silver as the foil wrapping the cork, and a distinctive gold in place of the mesh that adorns all of its wine bottles. The building now houses a 43-room, five-star hotel for you to stay at, an exclusive restaurant, a spa offering ‘wine therapy’, a viticulture museum, an extensive wine shop and luxurious gardens in which to enjoy a glass al fresco. You could say that this place has had a “rocky” history. 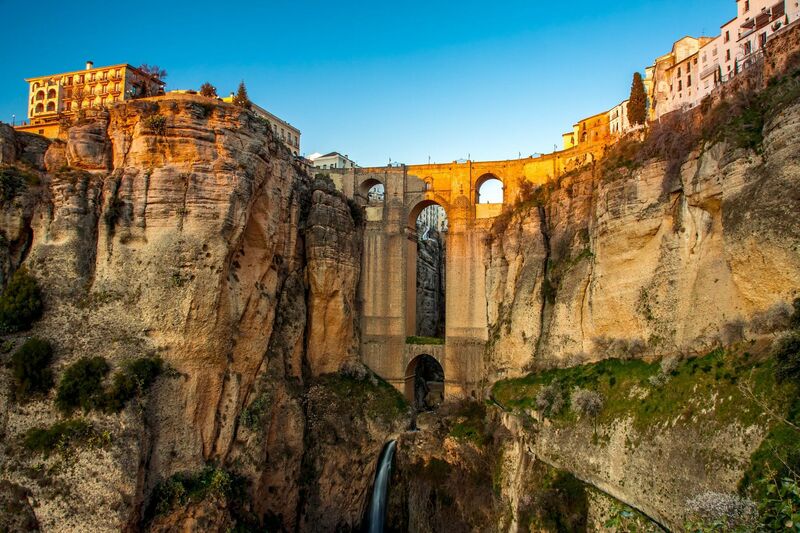 In the 1700s, the citizens of Ronda finally got what they wanted: A bridge that spanned a chasm that carries the Guadelevin River, accommodating direct traffic for an expansion of the city. The project was handed from one architect to another, with the final builder Antonio Diáz Machuca completing the installation in three stages. The final stage included the two top arches and a room in the middle – the latter housed prisoners later in its time. Gruesome rumours that civil war era prisoners were thrown to their deaths from Puente Nuevo persist to this day . But really, there’s nothing to be spooked about; you cannot deny the beauty observed from standing on that bridge, a vantage point overlooking the El Tajo Gorge canyon and its infinite horizon. Entrepreneur Eusebi Guëll had a choice piece of land, and he hired renowned architect Antonio Gaudí to create a city of houses for the wealthy. 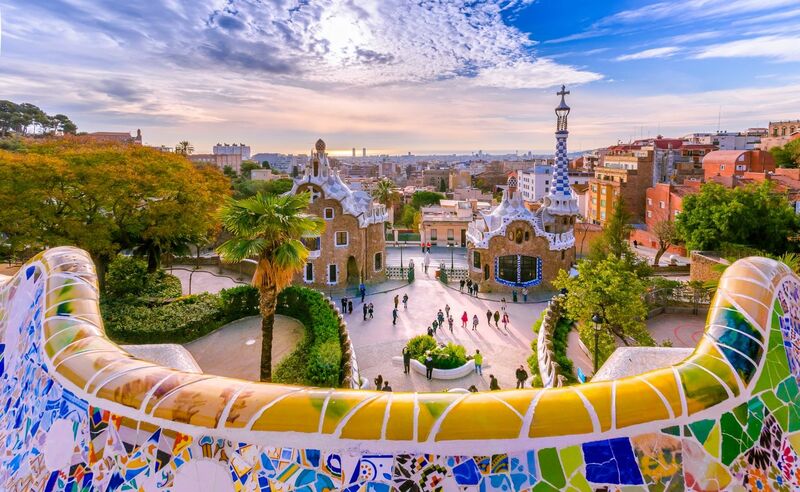 Though it was a commercial flop, the city council bought it after Guell’s death for use as today’s whimsical Park Guëll. In 1984, the park’s architectural and cultural significance was recognised and declared a World Heritage Site by UNESCO. An explorer like yourself gets to enjoy Park Guëll’s colourful spaces like the Plaça de la Natura (Nature Square), an esplanade planned for shows that could be enjoyed from the surrounding terraces. Part of the Plaça de la Natura is dug into the rocks, while the other is on top of a hypostyle hall. Its sides are bounded by technicolour tile-shard mosaics acting as balustrades, with a palm tree-like retaining wall, finished with large capitals. Looks familiar? 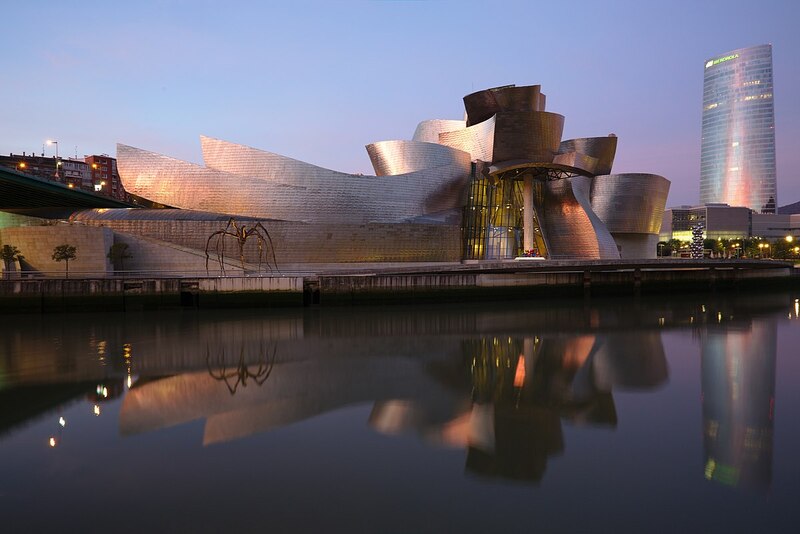 Fashioned by the same architect that built the Marqués de Riscal, Frank Gehry’s Guggenheim Museum in Bilbao has become one of the most important buildings in the 20th century. As Dan Brown imagines in his novel, the massive glimmering museum houses exhibitions from the Guggenheim Foundation, and it proves impossible to take in at first glance. Upon arrival, it looks almost like a conjuring of an alien hallucination: A swirling collage of warped metallic forms. More than thirty thousand titanium tiles glint like fish scales, imparting majesty that’s simultaneously organic and extraterrestrial. This expressionistic work of art, seamlessly unfolding its interconnecting shapes of glass, stone and titanium, remains a pinnacle in Gehry’s career. It’s unsurpassed in the integration of the arts and architecture, and sits along Nervión River, in the old industrial heart of Bilbao. 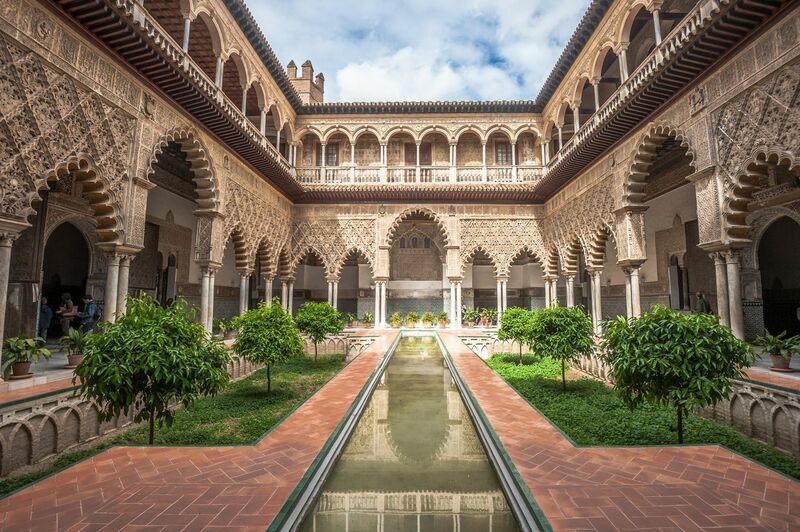 Located in the heart of Seville, the Real Alcazar is one of the oldest palaces in the world. Its top floor is still in use by the Royal Family today (Buckingham Palace? So passé). Seville’s millennia-long legacy manifests within its very own walls, amalgamating influences dating from the Arabic period, late Middle Ages Mudéjar right through to the Renaissance, Baroque and the 19th century. In this palace, you’ll love the Patio de la Donacellas, the main courtyard where ladies of the palace spent much of their time. In this section of the UNESCO Heritage Site, serene lushness surrounds a pool, accented with intricately carved wooden doors and arches.